Is a new arms race inevitable? Compared to the cautious optimism at the end of the Cold War, when the prospects for disarmament and a substantial peace dividend were universally welcomed, the rhetoric now is one of confrontation and existential threat. We may be living through an imposed austerity, with unprecedented cutbacks to the public sector and the welfare state, but the pressure to increase military expenditure has been relentless. Historically, this is unsurprising. The MoD has always held a privileged position with expenditure guaranteed on a range of sophisticated, high-technology weapons systems. For the political leadership of both major parties this was essential if the UK was to play its role as the junior partner to the United States in global, military power projection. The end of the Cold War and the collapse of the Soviet Union were used, not to maintain the momentum started by Gorbachev on both nuclear and conventional disarmament, but to consolidate Western military supremacy. By the time of the Bush administration in 2003, US military spending was over $417 billion, 47% of total world expenditure. The UK was the fourth highest at £30 billion 2. Under the Bush/Blair axis, with its determination to secure access to oil, the West embarked on a disastrous policy of invasion and occupation. Hundreds of thousands of civilians in Iraq and Afghanistan were either killed or suffered serious injury as a direct consequence of military intervention and social breakdown, while millions more faced a bleak future as refugees. However much the rhetoric remains of the need for defence to protect ourselves against dangerous enemies, the reality is an aggressive militarism that has been an abject failure. Yet, decisions are being taken by the government that will reinforce UK subordination to the United States as the very expense of the next generation of conventional armaments like stealth fighter aircraft makes the UK ever-more dependent on US technology. Common security offers the prospect for a much-needed and fundamental reappraisal of the UK’s role in the world. Two essential criteria are comprehensive disarmament and the release of resources from military spending for international economic and environmental programmes that address global security issues around poverty and climate change. This agenda can be traced back to the very founding of the United Nations and its inspirational Charter. Quite simply, the objective was to end the scourge of war after the most destructive conflict in world history. 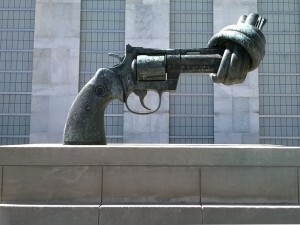 UN disarmament initiatives were based on the recognition that any new arms race must be vigorously opposed since the build-up of forces, in itself, was a major cause of instability, feeding the demand for further military preparations in an ever-increasing cycle 2 of confrontation. Resources squandered on armaments could then be used for social priorities that addressed the growing gap in wealth and power between rich and poor and the underlying economic and social causes of conflict. Since its founding, the UN has also been the leading body highlighting environmental concerns and the threat from climate change. Such is the scale of the crisis that there are growing calls for the rapid transition to a post-carbon economy, leaving coal, oil and gas supplies in the ground and satisfying future requirements through renewable energy. The scale of investment is one that has only previously been mobilised for arms production and war. The challenge is to mobilise on the same scale for common security and peace. There should be no illusions about the barriers to any progressive alternative. We are living through a neo-liberal political and economic experiment that is increasing rather than reducing income inequalities and is punishing the poor for the profligacy of the financial institutions. Economic growth and prosperity are seen in terms of unfettered corporate power and further exploitation of non-renewable resources, underpinned by Western military force even where this might lead to confrontation and war. The idea of an internationally coordinated disarmament and development programme around climate change and common security is anathema to the military-industrial-complex. 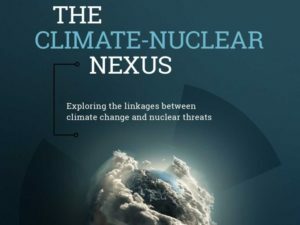 A climate of fear is being inculcated around a new arms race. Russia is re-established as a major threat on the scale of the former Soviet Union, while Islamic State (ISIS) is characterised as new form of apocalyptical terrorism, using its base in Syria and Iraq to build a network dedicated to the destruction of Western societies. The threat of war, therefore, far from receding, is muti-faceted and the world is becoming an ever more dangerous place. Yet the United States and its allies refuse to take any responsibility for the deterioration in relations between the West and Russia. 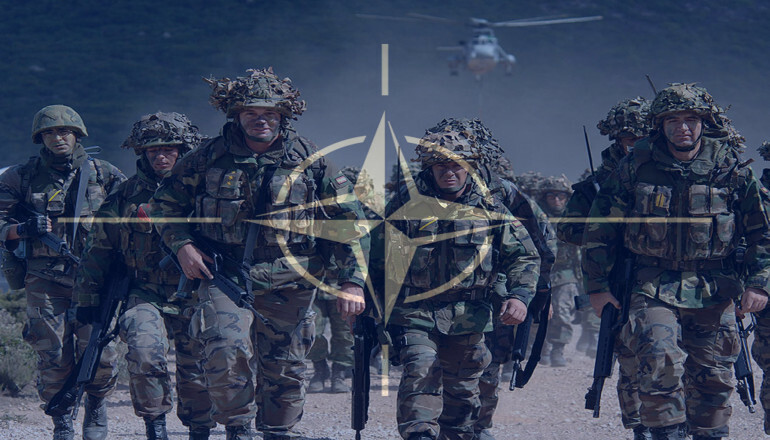 The policy of military encirclement through NATO and its support for corrupt and anti-democratic regimes in the Ukraine gave the Putin leadership a simple cause to mobilise domestic support for its own military build up. Nor will they take any responsibility for the chaos of postinvasion politics and economics in the Middle East and, more recently North Africa, leaving fertile ground for extremist groups. To argue for a de-escalation from military confrontation, therefore, is not an act of weakness but an act of strength when linked to common security policies that help transform the international system. The cancellation of major conventional programmes, including the new fighter aircraft and carrier fleet, as well as Trident, would not leave the country defenceless. Rather it would signal that the UK intends to play a progressive role in which military resources are redirected to climate change and international development programmes, while making a contribution to UN peacekeeping and peacebuilding. Now is the time, not for yet another defence review that will merely reflect our subordination to the United States, but for a common security review to free us from the dead hand of militarism. From the very outset, there was a fatal contradiction between the ideals of the UN for a new international framework to prioritise disarmament, and the reality of an institutional architecture that ensured the interests of the major powers were given precedence – most obviously in the creation of permanent seats on the UN Security Council and the veto of those countries over majority decisions made by ordinary members of the UN. Cold War power blocs, dominated by the United States and the USSR, effectively transformed the UN into a vehicle for mutual condemnation and recrimination. However, the plan was rejected by the Soviet Union. It did not trust a verification regime dominated by the United States and the UK that had developed the bomb in secret and at a time when the United States still had a monopoly of nuclear weapons. The counterproposal that all existing nuclear weapons be destroyed, followed up by an inspection regime to ensure future compliance, proved unacceptable to the United States. The Baruch Plan could not break through the cold-war calculations of the superpowers but it encapsulated much of the original vision of how the UN might operate, through international agreement, verification procedures and confidencebuilding measures to prevent the spread of nuclear weapons. For a brief period, at the end of the Cold War, common security seemed to be gaining support but force reductions were never translated into an internationally agreed timetable for disarmament. Nevertheless, at a time when the new arms race is developing a grim momentum and the challenges of social and environmental breakdown are even greater, this remains the most comprehensive framework for addressing the major security issues facing us in the 21st Century. Climate change is an existential threat and common security is imperative to resolve it. The scientific consensus is that global temperatures are rising at an alarming rate, caused by increased carbon dioxide emissions. Only by keeping fossil fuels in the ground can the process be halted. Various predictions have been made on temperature increases that range between 1.8% to 4.0% centigrade, bringing with them extreme weather conditions and species extinction as eco-systems come under increasing pressure. Dependent on the scale and speed of change there may be a series of major tipping points including the melting of the Greenland ice raising sea levels; the interruption of the normal Gulf Stream causing serious temperature falls in Northern Europe; and the release of methane from peat bogs in Sweden and Canada, a gas even more polluting than carbon dioxide. The UK – A Defence Review or A Common Security Review? Yet, cuts to military expenditures were relatively modest at around 12% of the overall budget. Emphasis was made on sustaining a full range of military capabilities to deal with any, as yet, unclear but potential risks and threats. The USSR may no longer have existed and Russian forces entirely removed from central Europe, but there would be no deep cuts as at the end of the world wars. This time the UK would retain the capacity for the full range of conventional and nuclear armaments. Irrespective of the changed strategic environment in Europe, the government was determined to demonstrate its commitment to the United States, now having clear military supremacy and an unmatched capacity to deploy forces anywhere in the world. The carrier fleet was maintained, deploying both fighter aircraft and attack helicopters, supported by conventional, nuclear-powered submarines. Nor was there ever any question that the Trident ballistic-missile programme would be reviewed. Cuts were still necessary because of the procurement costs of high-technonology weapons but these would bear down mainly on the numbers of armed-forces personnel and on administrative and other support staff. This pattern has continued for the past twenty-five years, through a series of sporadic reviews and ‘mini-reviews’. Whatever the changing strategic environment that they were supposed to address, all have rested on the basic assumption that the UK must retain the force structure necessary to support the United States. The setting of the MoD’s budget at 2% of GDP by the new Conservative government should come as no surprise. In itself, it could be seen as an arbitrary figure since resource allocation should logically follow on from strategic assessment. But it serves both a practical and symbolic function. The conventional equipment budget will absorb more than Trident, even during the period of the peak years of Trident expenditure, in order to pay for the carrier fleet and its attendant aircraft, drones and helicopter programmes. Nor does this take into account other potentially expensive conventional equipment under development. The long-term pattern will continue with cuts to armed forces personnel and the reliance on fewer, high technology systems that reflect our total dependency on the United States and can only be deployed as minor elements in US-led military power projection. What would be the UK’s strategic role under common security? The over-riding objective is to contribute to a decarbonised global energy economy, both through domestic investment and through a contribution to international development programmes. Clear targets can be set on the proportion of energy produced through renewables up to 2030 and to the amount of carbon emissions saved through clean energy and through energy-efficiency schemes. The cancellation of Trident and major conventional programmes provides the basic funding for a new common security budget with at least £10 billion a year for R&D and production across the range of renewable technologies. Any remaining role for the military will be through UN peacekeeping to provide support in civilian protection and conflict mediation; engineering reconstruction; and civil society institution building after conflicts. By the end of the transition period, the UK will have placed itself as a leading advocate of common security and disarmament, achieved self-sufficiency in energy supplies through renewables and contributed to international development programmes that makes real progress in decarbonising the global economy. The UK is expanding the warfare state while, simultaneously, dismantling the welfare state. Austerity has been used as an ideological tool to assert the principle that public expenditure for social programmes is unsustainable, while the military must be treated as separate and sacrosanct. The neo-liberal state will be a much smaller, hollowed-out one, where the MoD and the secret services take a higher proportion of public funds. A progressive alternative based on common security is entirely feasible, where the government redirects public funding to environmental and economic development programmes. But it is vitally important that the opportunity cost argument of transferring resources from arms production is made, not simply in terms of the cancellation of nuclear weapons, but also of major conventional programmes. The campaign against Trident has been an effective and popular one but it has been damaged by the tendency to claim that savings from nuclear weapons can be used to increase spending on conventional forces. Even organisations like CND have aligned themselves with senior military figures who recognise the futility of nuclear weapons but want extra resources for the carrier fleet through cancelling Trident. The majority of the MoD’s procurement budget, even during the peak years of Trident expenditure, will be spent on conventional weapons that contribute nothing to our security. Through our role in US-led invasions and occupations, the use of those weapons has resulted in the deaths of hundreds of thousands of innocent civilians and untold misery for millions in the ensuing social and economic chaos. And all for the sake of fossil fuels that should be kept in the ground. Any serious common security alternative must be based on both nuclear and conventional disarmament, requiring a major international effort to rekindle the disarmament process. How far we are from the original tenets of the UN is epitomised by the fate of the Nuclear Non-Proliferation Treaty (NPT), signed in 1968 with the intention not only of preventing the spread of nuclear weapons, but also ensuring nuclear disarmament. However, after nearly fifty years, the existing nuclear powers are carrying out modernisation of their weapons while claiming to honour their treaty obligations. The original ideals of the UN, to integrate nuclear disarmament into a comprehensive framework that works towards deep cuts in conventional forces; the closure of overseas bases; and the prohibition of arms exports; is all dismissed out of hand as totally unrealistic. According to the prevailing mantra, we can’t predict the future and must prepare for all eventualities, including major power conflict and the threat of global terrorism. But the future is entirely predictable if we continue down the same path – an accelerating environmental crisis caused by climate change, massive economic and social dislocation and millions of people made homeless and refugees in zones of instability. At the same time, when we desperately need funds for development, the world will be spending over a trillion dollars a year on armaments, mainly by the United States and its allies to maintain a global presence and whose real agenda is to protect Western corporate interests. 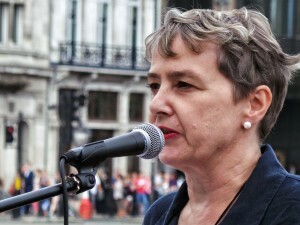 Significantly, there is a growing popular base for alternatives to neo-liberalism and militarism, including the global, social movements on climate change pressing for binding international agreements and advocating divestment from oil companies; the realignment of left parties in Europe on anti-austerity programmes; the SNP’s mandate for the removal of Trident submarines; and the recent and welcome debate in the Labour Party through the Corbyn leadership campaign on cancelling Trident, cutting military expenditure, withdrawal from NATO, and a conversion programme to utililise arms resources for socially-useful purposes. 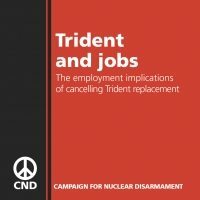 The UK is in a unique position to play a leading role in this progressive movement, as the first post-military society promoting a new UN disarmament agenda and mobilising a multi-billion pound common security fund for international, economic and environmental development. The timescale for the transformation to a postcarbon economy is urgent but entirely achievable given the will of the international community to end the scourge of war and to promote peace and common security.